Ms. Adlouni is overseeing the Foreign Division of the firm. Ms. Adlouni is an arbitrator and mediator in Kuwait State with The Judicial Arbitration Court, GCC Commercial Arbitration Centre, The Kuwait Commercial Arbitration Centre- Kuwait Chamber of Commerce & Industry, and Kuwait Arbitration Centre at the Kuwait Bar Association, and has acted as a sole arbitrator with relevant counter-parties. She is also admitted to ASIP and the Union Advocates Arab. Ms. Adlouni has acquired extensive professional experience in Banking, Capital Markets, Investment, Private Equity, corporate governance, corporate finance deals, valuations, asset portfolios, private equity advised on establishment of private entities, operation investment agreements, securitization and debt capital market. Besides, the intellectual property and IT matters including counseling and licensing. Real Estate Project Development and Property acquisition in addition to drafting related agreements. 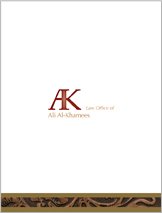 Ms. Adlouni provides consultancy to add value to foreign firms seeking to conduct business in Kuwait and the Middle East on commercial, investment, bankruptcy, liquidation matters and developing aspects of the Kuwaiti Law. Ms. Adlouni specializes in the corporate and commercial fields including but not limited to conventional and Islamic finance transactions, franchising, promoting foreign investment, taxation and agency distributorships, in addition to drafting local and international commercial, financial and investment agreements and Arbitration. Ms. Adlouni is specialized in local and International Alternative Dispute Resolution such Arbitration, Mediation and Conciliation as well as carried complex litigation process. Ms. Adlouni, is among other significant contributing local partners to the World Bank IFC (International Finance Corporation) for its annual surveys and reports of “Doing business in Kuwait” providing legal analysis and contribution for researching the legislations in Kuwait researches, Borrowers and Lenders in getting credit, Protecting Investors in Kuwait market by providing the applicable Kuwaiti Laws thereto.